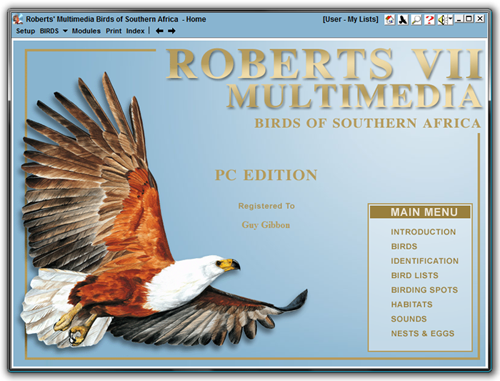 Roberts VII Multimedia Birds of Southern Africa is a comprehensive and interactive multimedia program. 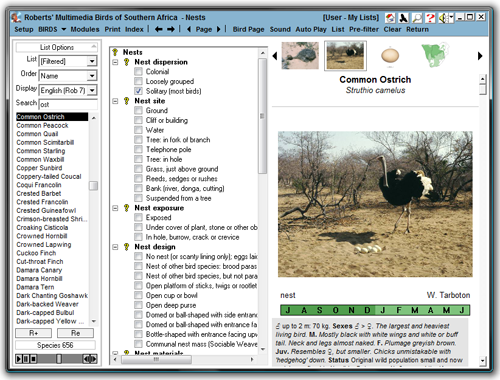 It combines multimedia data on over 960 Southern African bird species, with eight interactive modules that facilitate almost every aspect of "computer birding". 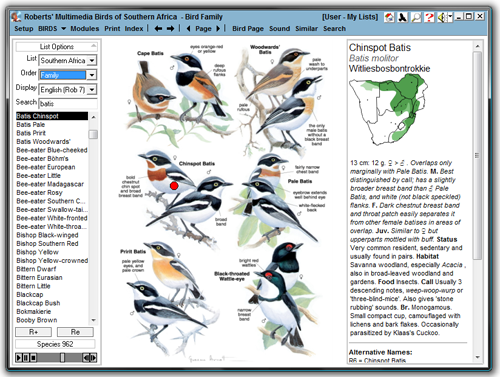 The BIRDS database includes • the comprehensive text of ‘Roberts' Birds of Southern Africa - 7th Edition’ • the field-guide text and illustrations of the ‘Roberts Bird Guide’ • Guy Gibbon's collections of bird sounds • 962 individual bird pages • over 40 ‘new’ species • 180 "field guide" pages • over 1700 illustrations, 6000 photos, 900 bird sounds, 500 nest photos, 700 egg photos • Roberts 6 or 7 English names • Afrikaans, Scientific, German, and French names • colour-coded distribution maps • over 6000 rare bird records • rare bird maps • seasonal status bar • endemic and red data species • habitat soundtracks as background. • Search for a bird or browse the larger ‘field-guide’ pages • View individual bird pages, compare similar birds, add notes, and print bird pages • Identify birds, nests, eggs and sounds using simple observations • ‘Go Birding’ at over 270 birding spots, with text, photos, maps and bird lists • Generate bird lists for any area or create your own personal lists • Edit bird pages and birding spot pages, and add your own photos and multimedia • Enjoy a screensaver with over 2000 photos • Link to our web page for the latest program updates. Requirements: Windows XP/Vista/7/8 (excl. Windows 8 RT), Internet Explorer 5 or later, Pentium 2 or better. Minimum hard drive space 2GB. The program is distributed on both DVD disc for PC, and USB flash drive for small PC’s without a disc drive. One of the many new program developments has been the introduction of ‘wizards’ to help the user select the appropriate module or function, while some such as Identification have been developed into sequential screens that guide you through the process. The wizards also include links directly to pages in the Help File. These wizards have proved to be a wonderful way of showing the many functions available in the program. 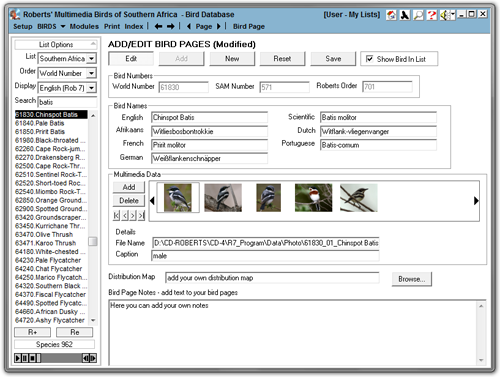 The Bird Lists module has been upgraded to include GPS-based records imported from the PDA edition. 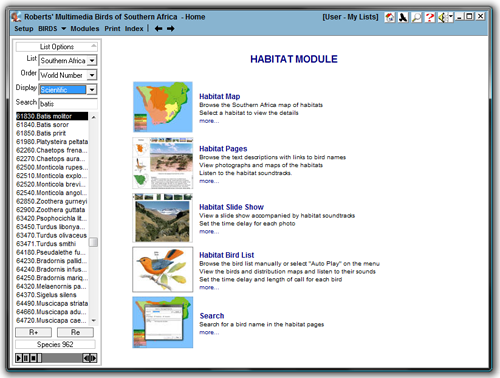 A new bird list import and export format is designed to facilitate SABAP2, our national bird atlas project. 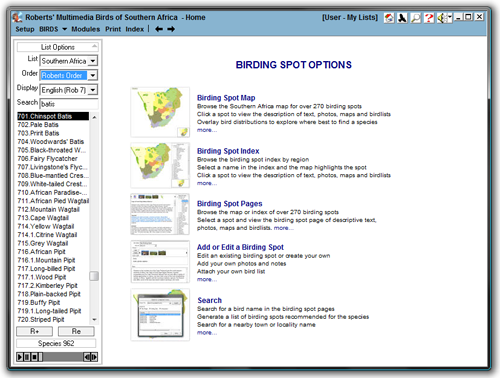 The Birding Spot module has the added functionality of adding or editing birding spot data, including adding your own photographs and bird lists. 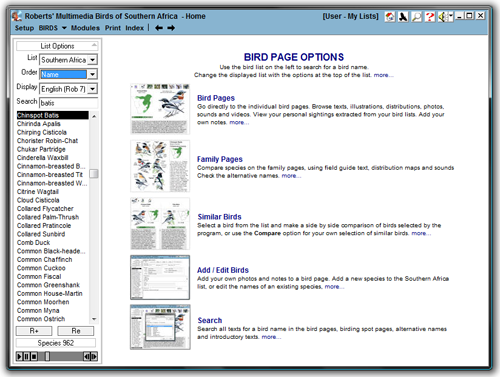 On the Bird Pages you can add your own notes and photos as well. 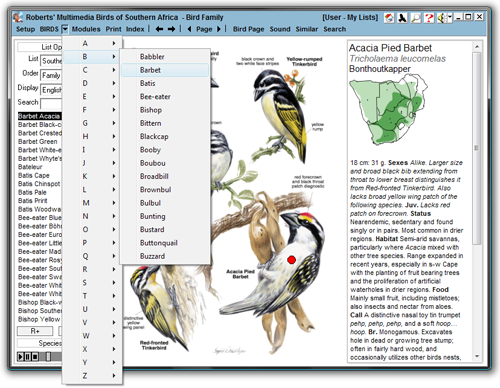 Other improvements include a fully adjustable program window and sizing of fonts in both the bird list and general texts. In terms of data we have entirely new and expanded texts from Roberts Birds of Southern Africa - 7th Edition and field guide texts from the Roberts Bird Guide by Hugh Chittenden, new illustrations with identification pointers, maps updated with distributions of subspecies, rare bird records updated, the photo database expanded to over 6000 quality photos, completely re-edited bird sounds, and alternative bird names expanded to include many languages. In fact not much of the data has been left untouched. 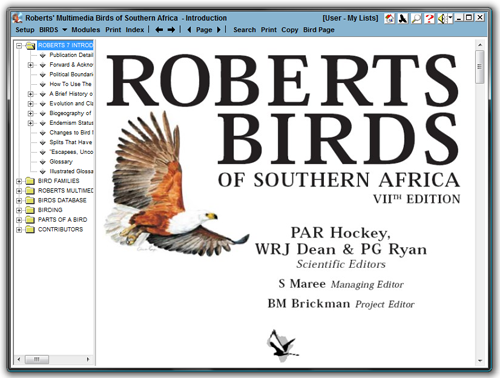 This module includes the full text introduction from Roberts' Birds of Southern Africa - 7th Edition, an introduction to this program Roberts 7 Multimedia PC Edition, and a description of all the bird families. 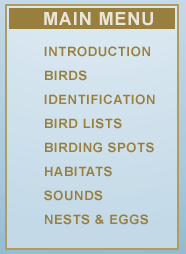 The bird list panel is an integral and permanent part of the program, allowing quick access to any species. 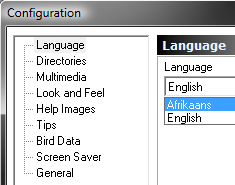 You can choose the type of list, what language or names are displayed, and how the list is ordered. The search function works progressively as you type. 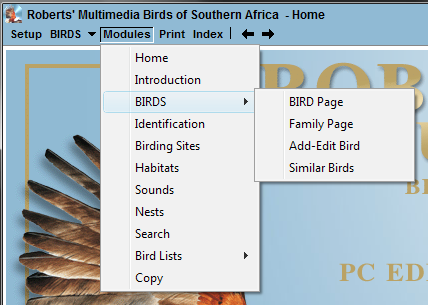 The Bird Page Options highlight the modules and functions available in the BIRDS module. 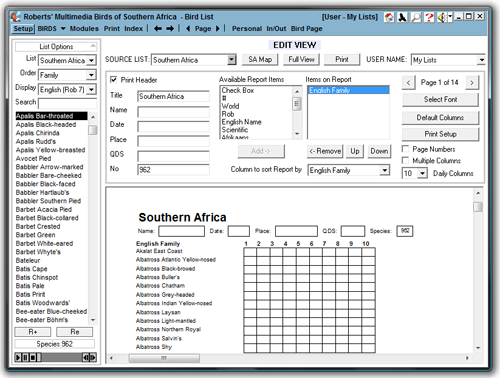 The Family Pages function as a comprehensive electronic field guide. 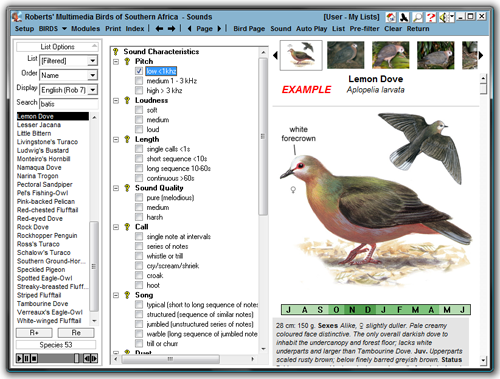 You can page through the family pages, select a bird, view the field-guide text and distribution maps, and listen to the bird sound. Alternative names are also listed. 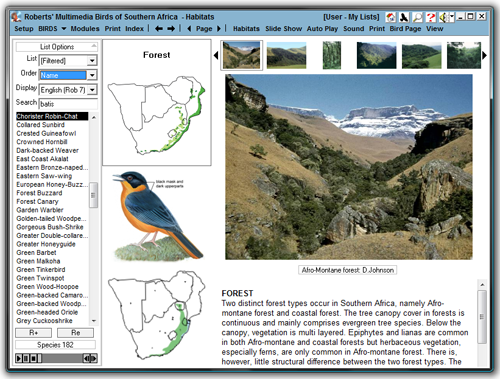 The bird pages present all the available data on a species, including field guide text and full handbook text, illustrations, distribution maps, bird sounds, and photographs. The distribution maps are colour-coded to indicate status of resident, breeding migrant and non-breeding migrant, and shaded to indicate density of distribution. 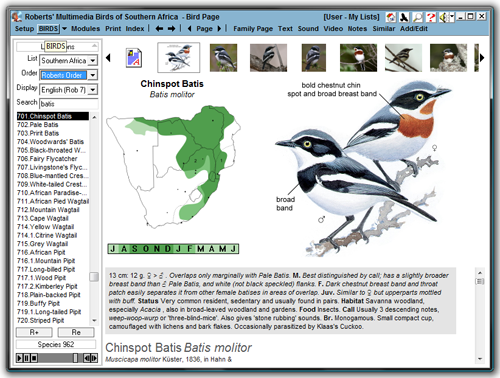 The status bar indicates both occurrence and breeding throughout the year, while endemic and red data species have colour-coded indicators. 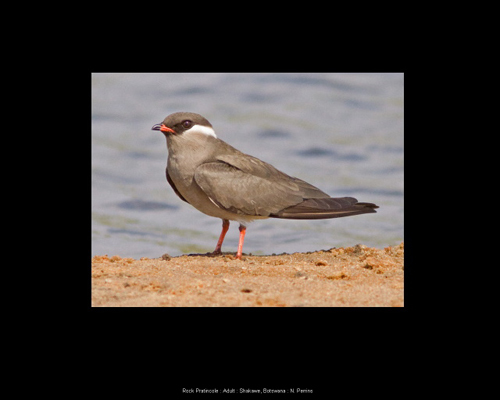 The text page also includes a summary of rare bird records for rare species, notes for the sounds presented, your own notes on a bird, and a summary of your bird list records for the species. 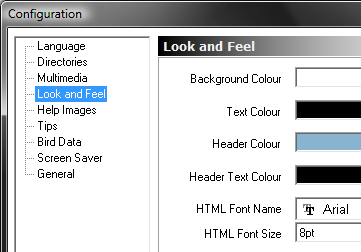 The text can be expanded to full screen, as can all images be expanded to fill the program window. 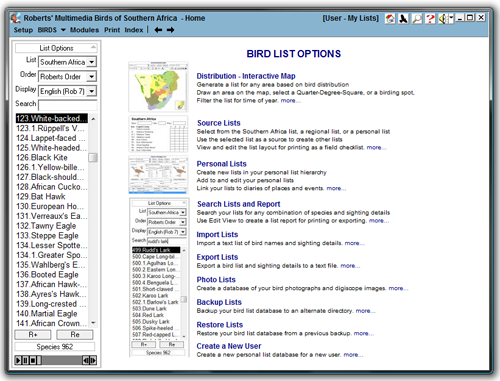 The Add/Edit module is used to edit the names or add multimedia data to any bird in the list, add a new species to the SA list, or add birds from the world list to your personal list. 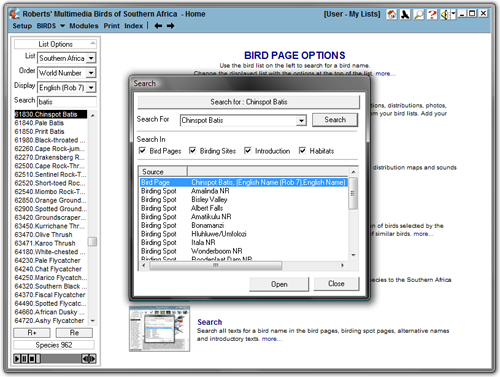 The search function will look for any bird name, place name or word combination throughout the texts in the program, and return a list of links to follow. 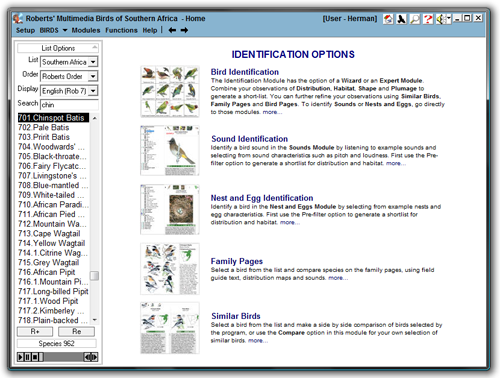 This page highlights the range of identification options available, including identification of birds, sounds, nests and eggs. 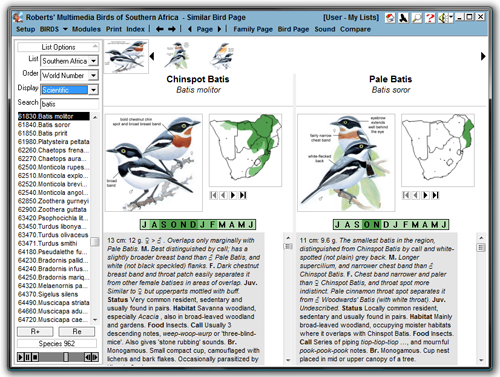 The Family pages and Similar Birds module also facilitate comparison of species. The Identification Wizard guides you through the selection of distribution, habitat, bird shape and plumage characteristics. Unlike a dichotomous key which discards all options except that selected, the program allows multiple selections within a category, and sorts between categories to generate a short-list. 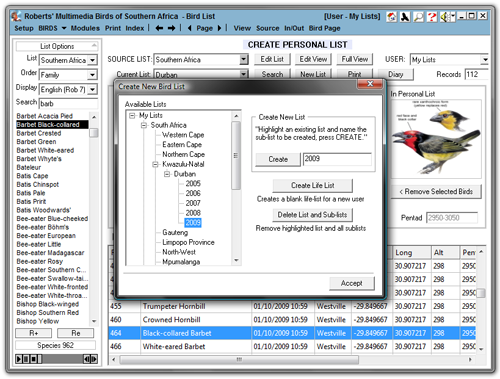 The bird list changes dynamically as you make your selection. Once your selection is completed the wizard returns to the Identification Module below. 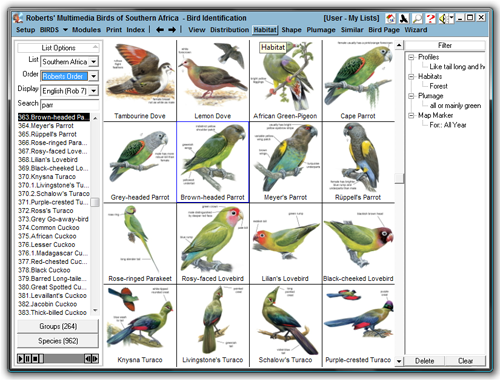 The identification module presents a gallery of the species shortlisted by the selection of distribution, habitat, bird shape and plumage characteristics. 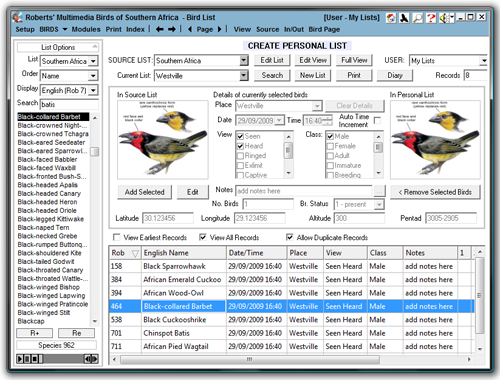 The bird list changes dynamically with each selection, the filter option allows de-selection of any characteristic, and the Bird Page or Similar Birds functions can be used for final identification. 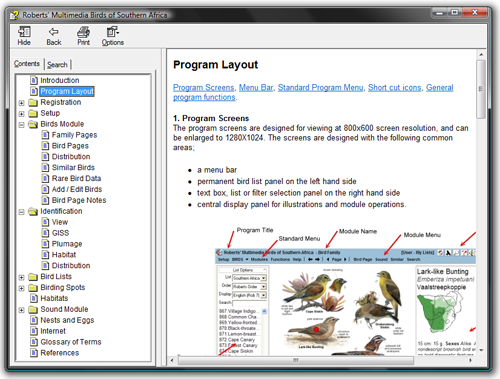 The program includes a comprehensive range of functions for generating and manipulating bird lists. 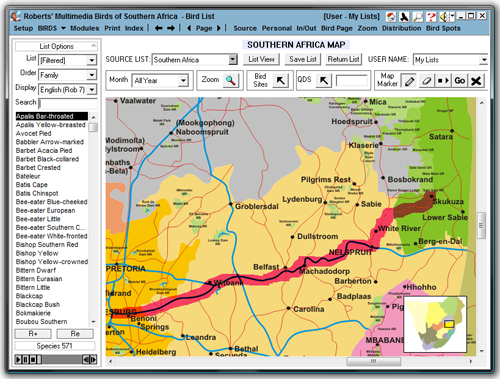 The Interactive Distribution Map is a powerful tool for generating a bird list for any area and selected time of year. 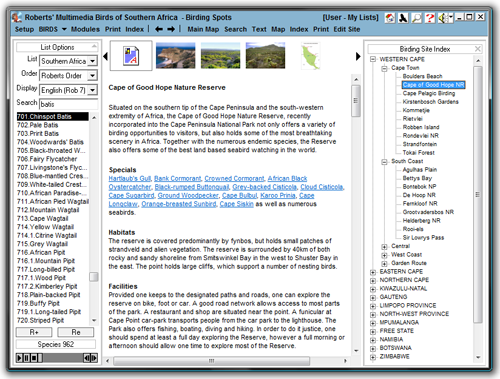 Pre-generated Source Lists include all regions and Birding Sites. Personal Lists report to a life-list hierarchy, and include a full suite of sighting details including GPS co-ordinates. Search Lists finds any combination of data, and Import/Export, Backup/Restore and Photo Lists complete the list options. Create New User accommodates multiple users, with a list database for each user. 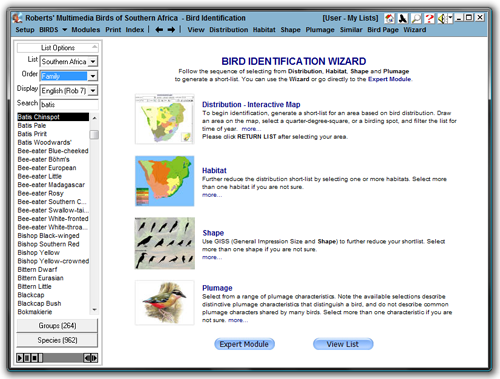 This module generates bird lists based on bird distribution, and is a powerful and effective function. 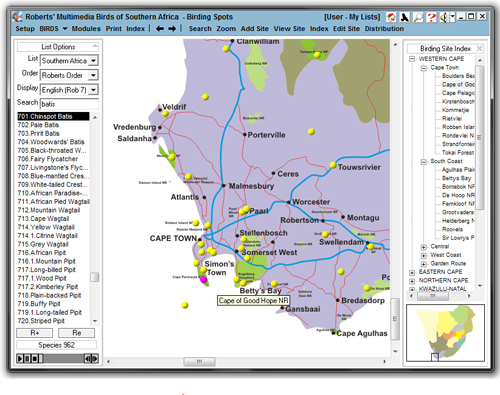 You can draw a route or an area to generate a list, filter it with the time of year, and switch on an overlay of bird distributions to check which birds coincide with your precise locality. Other functions include lists for quarter-degree-squares and Birding Sites. The source list module has pre-generated lists for all regions and Birding Sites. Personal lists can also be loaded as source lists. The lists are used either within the program as a reference list, or printed for use in the field. A range of print options are available. The Personal list module works by graphically ‘adding’ a bird from the source list on the left to your personal list on the right. Almost all possible sighting details are catered for, while the range of functions available include creating a new list, adding species to your list, adding notes to a diary, searching for records, and printing the list. The Birding Sites module includes details of over 270 birding localities, with an interactive map, index of localities, birding spot pages, and functions of adding your own spots and photos or searching for where to find a bird. The birding spot pages include a full description of the locality, with bird names highlighted and linked to the bird pages. Edit Spot can be used to add your own notes and photos. 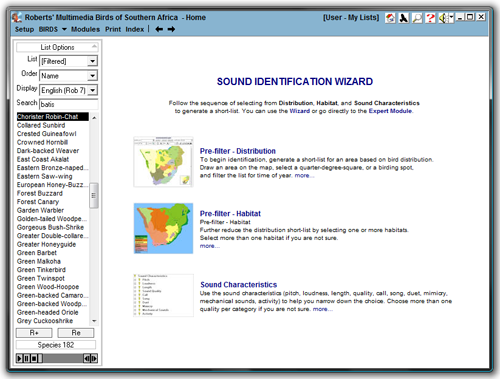 The Sound Identification Wizard guides you through the selection of distribution, habitat, and sound characteristics. The program allows multiple selections within a category, and sorts between categories to generate a short-list. 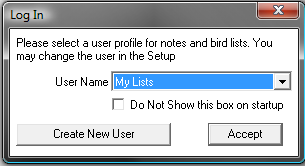 The bird list changes dynamically as you make your selection. 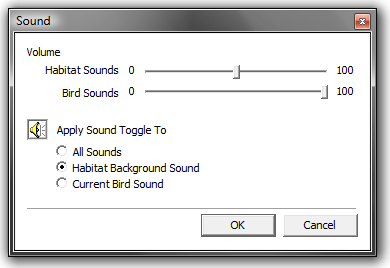 The module comprises a selection panel of sound characteristics, a dynamic bird list that updates with each selection, and a display panel of either the example or bird selected by the user. Once a characteristic is selected, the shortlist can be explored for similar sounds. The display panel includes all the bird page information, allowing a detailed exploration of a species directly in the module. 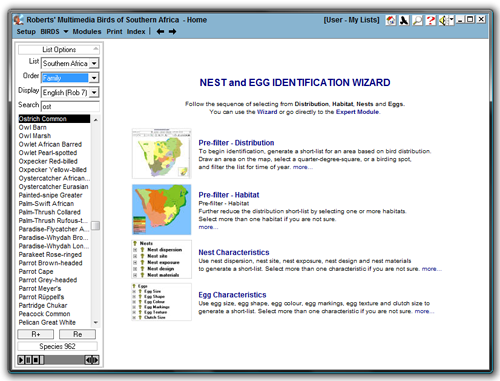 The module comprises a selection panel of nest and egg characteristics, a dynamic bird list that updates with each selection, and a display panel of either the example or user-selected bird. Once a characteristic is selected, the shortlist can be explored for similar nests or eggs. The display panel includes all the bird page information, allowing a detailed exploration of a species directly in the module. The stunning screensaver includes over 4000 quality photographs. The program includes a detailed context-sensitive help function available from the shortcut button at the top right of the screen.